Use this type of object to draw lines at any angle. 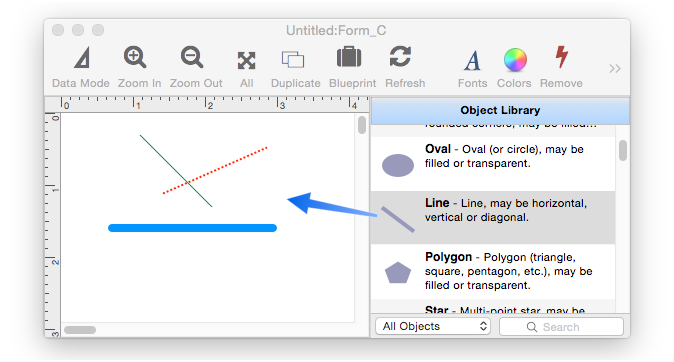 The Special Object Properties panel allows you to specify that a line must be horizontal or vertical. If neither of these options is checked the line ends can be dragged to any angle, but with either of these options checked the line will be restricted to either horizontal or vertical alignment. The Special Object Properties panel also allows you to specify the end cap style of the line. You won’t really notice the end cap style unless the line is quite thick. This illustration shows the three styles available. To learn about modifying a line’s color, stroke (thickness), opacity and drop shadow, see Form Object Appearance. 10.0 Updated Carried over from Panorama 6.0, but now with the ability to specify lines that are always horizontal or vertical, and to specify the end cap style.